“Today is a day that I’ve been looking very much forward to all year long. It’s one that we have heard and we speak about and we dream about. And now, as the President of the United States, it’s my tremendous honor to finally wish America and the world, a very merry Christmas,” he said. The President recalled 1870 legislation signed by President Ulysses S. Grant making Christmas a federal holiday. “And I sort of feel we’re doing that again. That’s what’s happening,” he said. 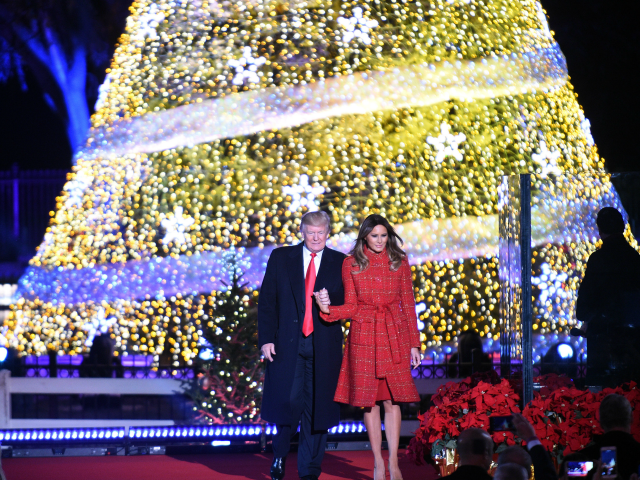 “We’re thrilled to think of the people, across the nation and all across the continents, whose spirits are lifted by the miracle of Christmas,” he said. In particular, he thanked those who are serving the needy, our military men and women who are stationed around the world, keeping us safe, our law enforcement officers who protect our streets and secure our homeland, as well as America’s teachers, pastors, and all those religious and those people that have taught us so much, for their leadership in our communities and our society. As a final word of gratitude, the President thanked America’s families. “At Christmas, we are reminded more than ever that the family is the bedrock of American life,” he said.